"Instrumental Demonstrations: Sounds and Rhythm Styles". In the final part of the series I move on to special effects. I start with an effect I started decades ago, playing the dulcimer through a sheet of fabric. This is what I call an acoustic effect. I rememeber when I was travelling around out west on a mountain bike withe my first dulcimer riding on top in back, I would stop and lean the bike against something and start playing right through the piece of sheeting I used as a dust cover. It started as a gag, but I liked the damped effect. Later, when performing on the street I used anything from a sheet to a rug as a dust cover, and plastic when it rained, and tried playing through them all. I read somewhere that in Persia, long ago, a student would be tested by having to play through a silk scarf laid over the instrument. One of my lessons, especially to kids, was that it takes practice to get good at anything, practice, practice practice, till you know what to do without thinking and perfection is natural. And sometimes adults would ask if I really hit specific strings of just flew around generally. So I’d tell that story of Persian dulcimer (Santur) players, lay the dust cover over the dulci and play. The kids would goggle, and adults could hear the progression of individual notes clearly, not losing them in the wall of reverberation and resonance that is characteristic of the dulcimer. I use a piece of white felt for this demonstration, also my present dust cover and sunshade, though primarily actually chosen for its use as an effect, since it tends to attract a too many bits of twigs and bracken to be considered the best dust cover. But it makes what I am doing clearly visible, you can even see the felt itself rebounding from the individual strings as I play. As always, I can’ show you everything I do to effect the sound. I can play through other materials, and I am still experimenting with installed damper pedals like a piano, so I can control the intensity of the effect and switch back and forth while playing. I also use special techniques, like bending notes and using harmonics. The design of the dulcimer is still evolving and expanding, though the core is complete, the work has moved on to the potentials outside that, like acoustic effects. Though in the end, it comes down to what is practically useful in a song, and I’ll use all the time, and what is used as piece of great showmanship, to entertain and teach, which does have value, too. As a final note, this video was also recorded in the first session with an extra acoustic microphone overhead. As I talk about in that video, how you record any instrument has a great effect on the sound, both in the recording and in later mixing and production. 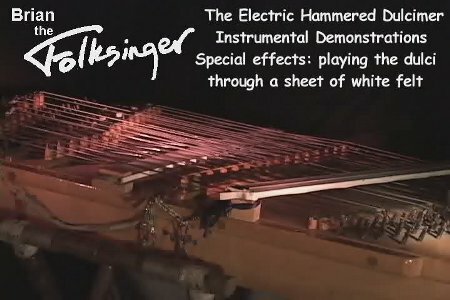 Here, the sound of the hammers hitting the felt is even more apparent than in the other video from this session without felt. And you can probably hear the sound of the rain dripping off the eaves outside the window. This entry was posted on Wednesday, April 28th, 2010 at 5:13 am	and is filed under The Electric Hammered Dulcimer. You can follow any responses to this entry through the RSS 2.0 feed. Both comments and pings are currently closed.